Catholics should be consistent in public life and need to make protecting innocent life a serious political priority, Bishop Thomas J. Olmsted of Phoenix has said in the latest edition of his booklet on the duties of Catholic voters and politicians. The booklet “Catholics in the Public Square,” now in its fourth edition, makes a distinction between support for intrinsically evil issues and support for different methods of achieving policy. The guide reiterated the need to examine one’s conscience and the need for Catholic politicians to oppose laws that allow or promote abortions. “If a politician is actively supporting and furthering the culture of death, he is not only causing scandal; he is sinning. Similarly, when a politician performs actions (like voting) that allow for abortions and even promote abortions, or that mandate the distribution of contraceptives by pharmacists and others, that politician is materially cooperating in grave sin,” the bishop’s booklet continued. These politicians must make a sincere confession before receiving Holy Communion, he said. Because the harm they have done was public, they should also publicly make amends. The booklet, released Sept. 17, features a new foreword by Archbishop Jose H. Gomez of Los Angeles and updated material from Pope Francis. The new material includes excerpts from the Pope’s recent encyclical “Laudato Si” and his speeches during his trip to the United States. “It only makes sense that if Catholics are supposed to live their faith in all of their daily activities that they should also take their faith into account while voting,” he added. A Catholic’s preparations to vote must include proper formation of conscience, followed by research of important issues and candidates that will appear on the ballot. Archbishop Gomez’s foreword to the booklet also reflected on Catholics in the public arena. “The Church needs clear and courageous teaching and witness to confront the idols of a secularized, post-Christian America,” Archbishop Gomez said. “Of course, if one’s faith does not impact on one’s whole life, including one’s political and social responsibilities, then it is not authentic faith; it is a sham, a counterfeit,” he countered. “The Catholic vision is spiritual not political. Catholics belong first of all the ‘city of God.’ But we have a duty to build up the ‘city of man,’ to correct injustices and seek a world that reflects God’s desires for His children — what Jesus called the kingdom of God and the Apostles called the new heaven and new earth,” the archbishop said. The fourth edition booklet, published by St. Benedict Press, is available in an eBook version at Amazon and at the webpagehttp://dphx.org/catholics-in-the-public-square/. Its production was supported by a contribution from the national Knights of Columbus. The booklet is being distributed to the parishes of the Phoenix diocese. The issues of the 2016 presidential race are most important because this incoming president will probably appoint 2 or 3 judges to the United States Supreme Court. And this will effect the country not just for 4 years, but for probably 20 years or more. Interestingly, Hillary Clinton favors President Obama as Supreme Court Justice. How should Catholics understand the separation between Church and state? How do you respond to statements that Catholics should not impose their religious views upon others? What does it mean that Catholics should follow their conscience when making a moral decision? How does one fight best against secularization in our society and the misrepresentation of faith in the public square? What is the Church’s position on immigration? How serious are the current threats to religious freedom in the United States? Do Catholic employers violate the religious freedom of their non-Catholic employees when they do not provide abortifacients or contraceptives in their health plans? How can Catholics live in a manner that shows proper respect for God’s creation? For Best results download the PDF image below. Then View and Print from Adobe Reader, or else the fonts can get mangled. Link is to English version of Bishop Olmsted's web page. Defending The Bride is not mentioned. Link is to Spanish version of Bishop Olmsted's web page. 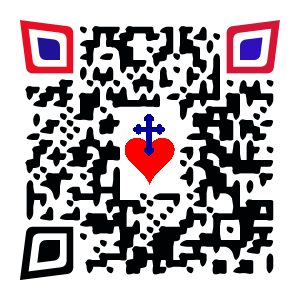 Scanning the QR Code above containing the heart and cross logo with a smart phone opens up this web page, which then links to Bishop Olmsted's web site and article, and Archbishop Gomez of Los Angeles' foreword. It is in both English and Spanish.